While sequencing entire human genomes is an important achievement of next-generation sequencing (NGS) technology, many clinical research goals can be achieved by sequencing a subset of the genome or genes of interest. Targeted sequencing pools large numbers of individual samples to sequence at the same time. This approach lowers the total cost per sample, reduces turnaround time, and produces a more manageable dataset. However, analyzing NGS data requires computational resources and bioinformatics expertise that are a major bottleneck in terms of cost and time, particularly for investigators who want to manage their own experiments. 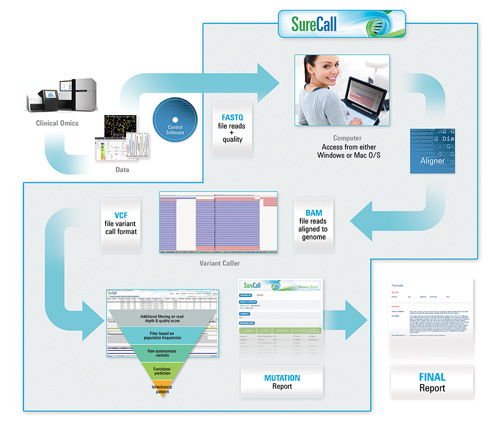 Agilent has developed an investigator-tailored NGS data analysis tool, called SureCall, that allows clinical researchers who use targeted sequencing panels for inherited diseases, cancer, and other areas to analyze, visualize, and contextualize NGS data using a single application and without need for coding or special hardware (Figure 1).